Overview of the steps involved in texture analysis of medical images. A, Construction of a simple GLCM from a stylized 3 × 3 pixel image with 3 gray levels (Ng = 3); distance, d = 1 pixel; and direction, θ = 0° (ie, left or right only). We begin by identifying the reference pixel, with gray-level i, and counting the number of neighboring pixels with gray-level j. 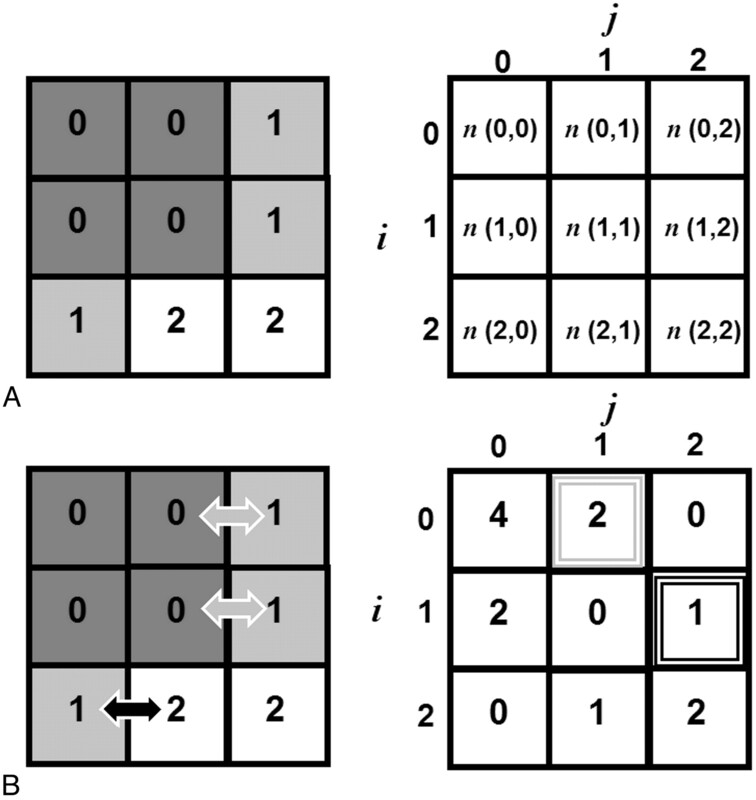 B, For example, looking at the second entry in the first row of the GLCM and counting n (0,1) we see 2 pixels with gray level = 0 that have left- or right-handed neighbors with gray level = 1. If we look at the entry for (i,j) =(1,2) we count 1 pixel with gray level = 1, which has a left- or right-handed neighbor with gray level = 2. 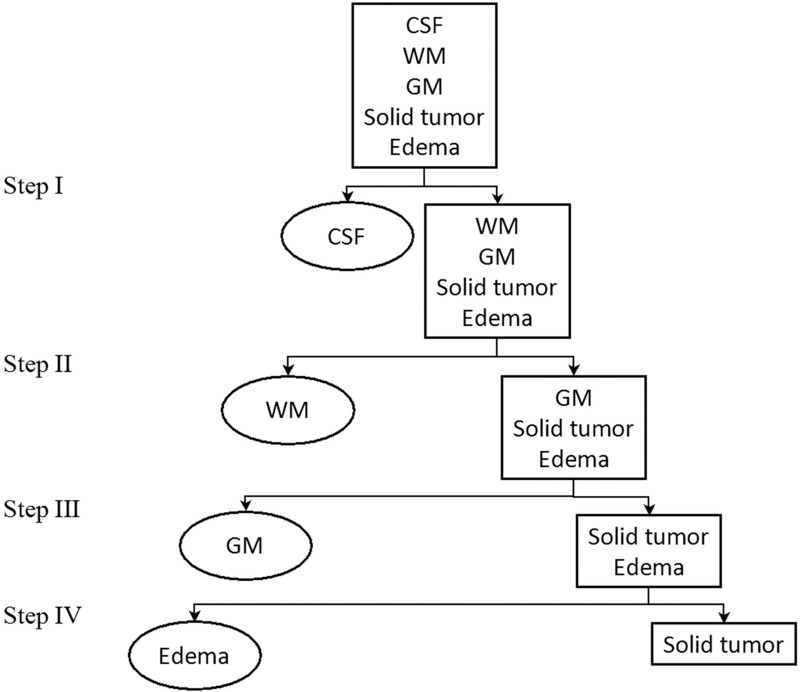 Schematic illustration of the 4-layer hierarchical decision tree used by Lerski et al,17 in which first- and second-order statistical features extracted from T1- and T2-weighted spin-echo MR images are used to delineate CSF, WM, GM, solid tumor, and edema. 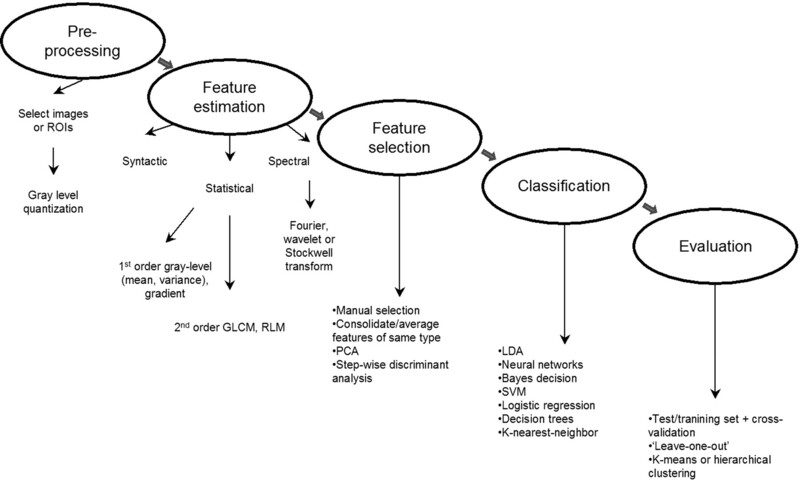 Stepwise discriminant analysis is applied at each of the 4 levels: At step I, the analysis reveals that the MGL of T2-weighted images is best for discriminating CSF and the rest of the regions. At step II, the MGL of T1-weighted and the f9 of T2-weighted images are best for discriminating WM and the rest of the non-CSF regions; at step III, the MGL of both T2- and proton-attenuation-weighted images and the f9 of T1-weighted images are best for discriminating GM and the combined edema and tumor regions. At step IV, the MGR of T2-weighted images and the f3 of T1-weighted images and the run-length distance of proton-attenuation images are best for performing the final decision, that which discriminates between edema and tumor regions.